How to prevent brake quick release from opening on rough roads? On rough roads or when there is a lot of vibration, the quick release on my front brake will sometimes pop open. Is there a way to prevent this from happening? If it helps, the bike is a 1995 Trek 370, which has Shimano 250EX brakes and Shimano Exage 300EX levers (according to BikePedia). That photo shows a pretty filthy bike. I'd start with a full disassemble of the rear brake caliper, and clean all the metal parts, and especially on the friction areas. Then I'd buff the whole thing with brasso or JIF cleaner. Then reassemble and see if it improves. If not, you could rough up the friction surface under the quick release using some sand paper. If the main spring in the brake caliper is weak then this may be a losing battle, because sourcing replacement parts is hard. In this case, just explore for some more modern double pivot calipers, and fit them up with new brake cables. The temp fixes suggested by others are exactly that - temp fixes. I wouldn't even ride this bike if your braking ability is compromised. Probably the simplest solution is to use a bit of tape to hold the lever closed, but tape may come off. Maybe you could use a small zip tie or the type of wire used to stop bolts coming loose. Criggie is right of course, so I’m going to amend this a bit. 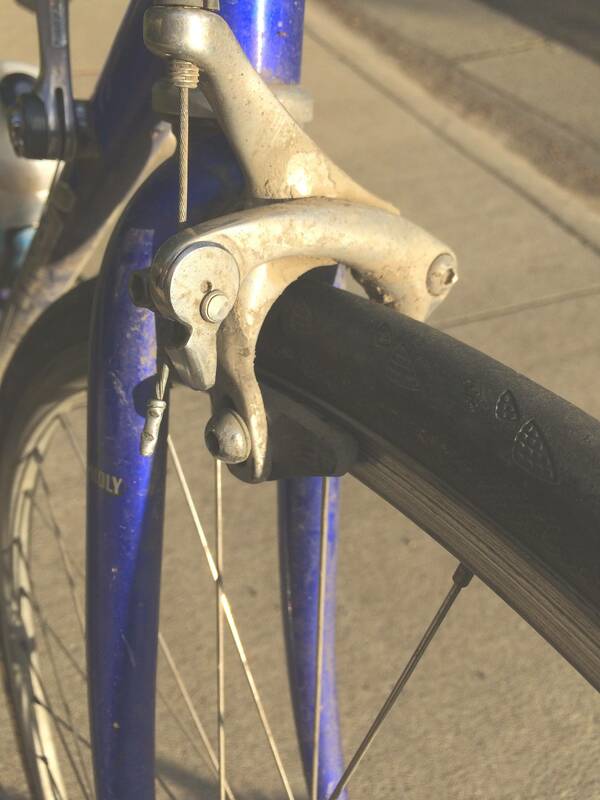 You should stop riding the bike until you replace the brake if your braking is compromised. The.QR isn’t really serviceable so if it’s not functioning the unit should be replaced. If you must ride to the bike shop to have this done, you could choose to bypass the QR by opening it fully and re-fixing (tighten) the cable to take up the slack. Might be a bit hacky, so proceed at your own risk etc. But I’ve seen people set their bike up like this on accident even, not realising how QR works. Sometimes bike maintenance just means replacing worn out parts. One other idea: I guess for the quick release to come loose the cable temporarily has to be unloaded by vibrations (try releasing the QR while pulling the brake, it shouldn’t be possible). Maybe the springs are too weak or the cable is too dirty? Is brake action smooth and easy? If not, you might want to replace your cables and housing first. What causes brakes to perform worse when the bike is loaded? When to use coaster brake, and when to use rear rim brake?